In 2017, I spoke over 260 times while being on the road for just under 300 days. Whether it was speaking at a youth group of five people in a small town, or teaming up with Chris Tomlin with 20,000+ people in a large city, I have become familiar with the road life along the way. I know this life – a life that has two sides, the side people see and the side people don’t see. Over the years, I have had countless emails and conversation with people saying, “I want to do what you do.” That’s awesome because we need more Christian speakers in Canada. However, in most of those conversations, I soon discovered that most people only see the one side of it. People sometimes think I eat at nice restaurants every day and sleep in luxury hotels every night in the nicest cities in the world. The reality is, there’s lots of sleeping on couches and on floors, followed by scouting out how to get the calories of three meals a day without having to spend money on three meals a day. It’s not exactly V.I.P living. Here’s the one that surprises people the most. On the surface level, you’re around people all the time, yet there’s a loneliness that comes with this lifestyle, as you are away from your relationship, family and friends for weeks at a time. You’re with everyone, yet you’re separate, as you sometimes come in, speak, pack up, and drive by yourself to the next town. Speaking is amazing, but it’s draining. A typical talk may create three or four adrenaline spikes, which science shows takes a toll on your body, as it takes days to recover. Well… when you speak every day for two months straight, you don’t have a lot of time to recover. Factor in not sleeping in your own bed, nor eating probably, and you end up with a deep tiredness that often comes along with the road life. You always have to stay humble, which is easier said than done. If you start losing sight of humility, then you’ll get a little bitter as your expectations aren’t met along the way. The reality is this: you are there to serve, not to be served. The road life is much more satisfying when you stay humble in every area along the way. This helps when you discover the event you drove two hours to speak at only has four people, or when you’re told your sleeping arrangements are on the floor. If you can develop legitimate friendships with other pastors, leaders, or people in your stage of life along the way, it will lessen the feeling of loneliness. Be intentional with connecting with these leaders before or after these events, because when you’re coming through their town down the road, they may be the best friend you have. 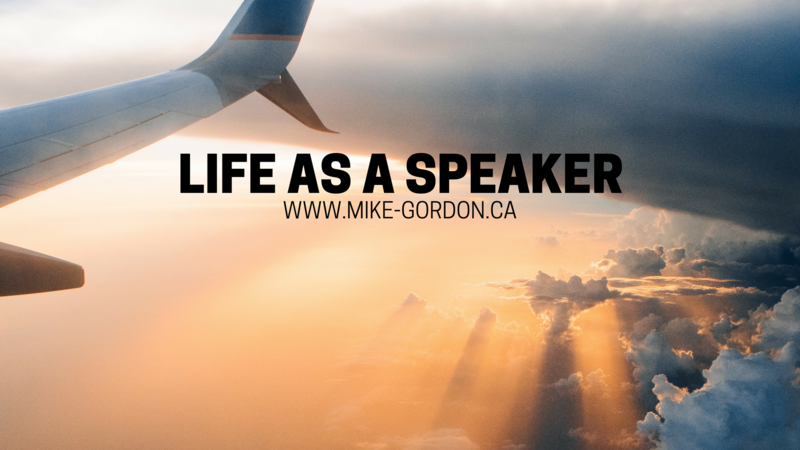 Passion is the only reason anyone would be crazy enough to travel full-time as a speaker. You need a passion for Christ and seeing people further their relationship with Him. This keeps you going, no matter how tired you get on the road. A passion to speak will get you out of bed any day of the week, as you wouldn’t want to do anything else with your life. Lastly, you need a passion for the people you have the privilege to minister to—every day you’re given an opportunity to see a life change forever. This is what makes you show up early to every event and stay there until the last people leave. Passion is everything. I have been blessed to be on the road full-time for the last seven years, speaking around the world as God has opened incredible doors to serve in this way. Despite the challenges that come with living on the road, I wouldn’t have asked to do anything else. Now in 2018, I have already been across the world speaking, and wrapped up another major spring tour—I love every second of this dream. We need more speakers on the road to do likewise, sharing and speaking about Christ.